Anthony Seibold and Michael Maguire have reportedly not spoken since Maguire's sacking by Souths. 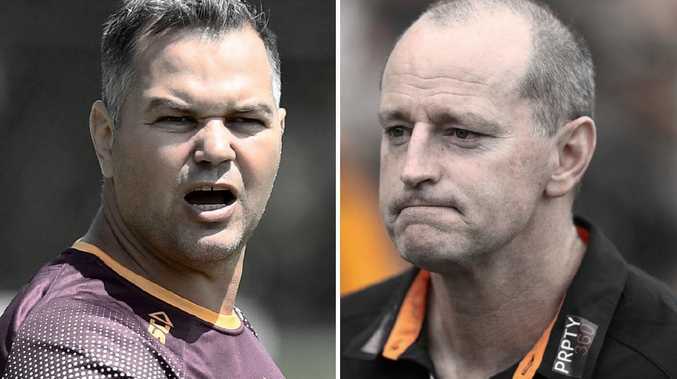 A "LIVE feud" between Anthony Seibold and his former mentor Michael Maguire has set the scene for the "grudge match of the year" between the Broncos and Tigers on Thursday evening. That's the word from Fox League's James Hooper, who lifted the lid on the pair's long-running feud on The Matty Johns Podcast. According to Hooper, Seibold and Maguire haven't spoken since Seibold was elevated to the head coaching role at South Sydney and Maguire was ousted. "I reckon this game is the biggest grudge match of the season so far," Hooper said on episode five of The Matty Johns Podcast. "This game in terms of the two head coaches is a real live feud. "I don't think they've spoken, Michael Maguire and Anthony Seibold, since Maguire was sacked as South Sydney coach. I don't know that they will be speaking after this game. Paul Kent added: "I guarantee you they haven't spoken and I guarantee you they won't be speaking." 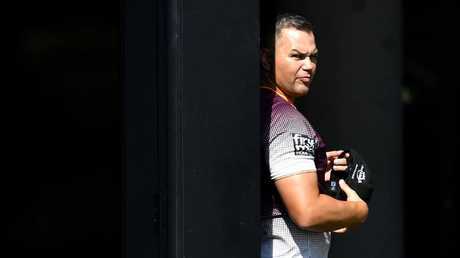 Anthony Seibold was the frontrunner for the Broncos’ coaching gig. In another fascinating twist to the relationship, Maguire had been in the running at one stage for the Broncos job but withdrew his candidacy once it became clear that Seibold was the firm favourite among powerbrokers at Red Hill. "It's been going around for a little while and another fascinating little subplot is that Madge actually even interviewed at one point for the Broncos gig," Hooper said. "I think at one stage he was a little bit keen on it, then he realised that it had all been set up for Seibs and that that decision had probably already been made months ago so he withdrew from the race." Michael Maguire’s Tigers are in the mix at 2-2 this season. Hooper further suggested Maguire was perhaps filthy with some of Seibold's actions in the lead-up to the coaching switch at the Rabbitohs at the end of the 2017 season. 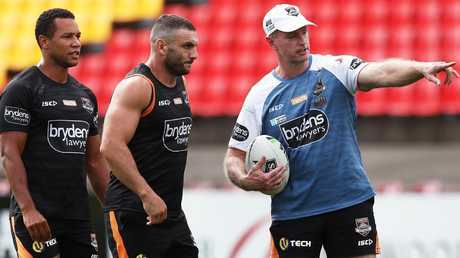 "There's been no conversations since Madge left Souths and there's even a theory that as Madge's demise was beginning to come about at Redfern that Seibs was in close with some of the players and perhaps even might have white-anted him a little bit," Hooper said.